Hollybeary Creations : Jan Release Day 1 with Newton's Nook! Jan Release Day 1 with Newton's Nook! It's time for the January Release from Newton's Nook Designs and we are kicking day 1 off with It's a Plan and Newton Makes a Plan and it's coordinating die. We are hoping today with the rest of the Team for a chance to Win these sets as well... you can find all the details at the end of this post. These sets are great for Planners and making cards as well. I like to use them on a large calendar but today I used them on a cute card perfect for Girls Night! I created some circles with Distress Inks and then I added a circle frame that I did cut using some circle dies. I stamped and colored each of the little Newton's using Copics and cut them out with the coordinating dies. I adhered them to the circle windows and then I used the It's a Plan set to create the sentiment. Comment on the NND blog and Design Team blogs (see list below)! The winner will be chosen at random from the collective reveal posts. Make sure to check out each of their blogs and comment for your chance to win. You will not know which blog has been chosen so the more you comment on the better your chances are of winning! You have until Thursday January 17th at 9pm EST to comment -- winners will be announced on the blog post on Friday, January 18th. Such a great card! Love all the fun lil Newtons!!! Awww! These are darling! I love all the options with this set! Darling stamps and clearly not limited to planner use. Darling card to sent to friends as an invite...make your gals feel extra special. Love these mini Newton stamps! This is such a cute way to use the images on a card! It would be so fun to invite friends to a girls night out! Very sweet! I bet your girls will enjoy the movie, too! Amazing card, it's brilliant how you used the new releases! LOVE so very much especially the Newton Makes Plans set!!! It's very useful!!! So stinking fun! These cards are exactly what I would love to create with these images! Perfection. Love the circles to give each stamp it's own platform. Love all of these images for all things crafting and planning. NND did it again! Wow! Fun! Versitle. greeting card. So darn cute. Very cute card. Love the movie theme! Sweet card made with those cute planner stamps! I really like how you use the small images on your card. Using the circles really draws the eye to the image and doesn't make it look lost on the card. What an adorable card! Love the pops of color behind those cute kitties! I'm in love with the possibilities of the Newton Makes Plans set! I'm not a planner, but they would be great for cards and tags and gift card holders and bookmarks and so much more! Adorable card! Love those newton stamps and love your fun design! I love the kitty with popcorn! What a great card!!!! 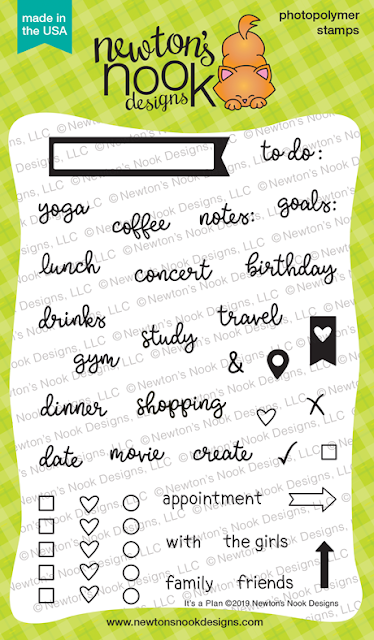 Love the way you used these cute Newton planner stamps on your card! So cute! Your card is just fabulous. Love how you used a few of the stamps into making this fun card! Love your card and how you used these sweet images! Darling card! Love these fun planner designs!Great idea to use them on a calendar too! 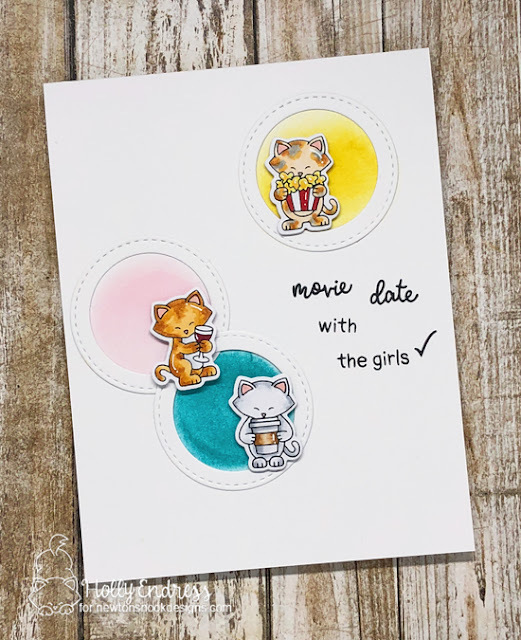 I am so in love with those cute kitties in Newton Makes a Plan - super fun card! What an adorable new release. Love the planner theme...it's perfect! Beautiful card! I love the versatility of these stamps! These stamps are so perfect for CAS creations! Love them! I love these mini-Newton stamps! I think I'd try and design a card for multiple uses of Newton. Love what you did. Very, very cute! I love these tiny Newton's! Very cute card design with the circles. Such a cute card! Love the design! I just love the Newton makes plans!! He is absolutely adorable!! Your card is so cute!! Amazing card and amazing planner stamp sets. I love the way you demonstrated how to use the new planner stamp set in a card instead of just for a planner. This card is adorable.